Well, I don’t. When I pray, I pray to the Father through the mediation of Jesus Christ with the assistance of the Holy Spirit. That being said, sometimes, when I find myself facing particularly troubling challenges, I ask others to pray with me. I confide to a Christian brother or sister, for example, that my great-aunt is very ill, or my friend’s child is getting into trouble at school, or my dear friend does not know the Lord and then, after confiding in them, I ask them to pray for me. Sometimes I do this with friends that I know here and sometimes I do this with the great saints of the church who have gone before in the Faith. What many Protestants disdainfully refer to as “praying to the saints” is really asking the saints to pray for us to the Father. No one has a problem asking dear sister Winifred, “that saint of the Lord” to pray for them when they are struggling. That is until she dies, and then asking that same “saint of the Lord” to pray for us somehow becomes taboo. It was fine to ask her (or any other saintly parishioner) to pray for us as long as they were on the earth, but once they shuffle off this mortal coil and ascend into the heavenlies either we should cease asking or they will cease answering. Does this make sense? This is indeed an abomination, but rather refers to conjuring spirits in a séance along the lines of the Witch of Endor in I Samuel 28. Later we will discuss how different conjuring spirits in a séance is than the picture of heaven presented bySt. John. The second primary scripture used against the intercession of the saints is I Timothy 2:5 which states, “For there is one God and one Mediator between God and men, the Man Christ Jesus…” Indeed, this passage is unquestionably true, but there are limitless individuals who may go before Jesus on our behalf and ask Him to pray for us to the Father. Again, if this passage were applied as some would suggest, asking the prayer warriors in your congregation to pray for you would be pointless. Up until now I have refuted negative arguments, rejecting the reasons “why not.” Now let us turn our attentions to the reasons why this is a positive aspect of our faith. In reciting the Nicene and Apostles’ Creeds we affirm that we believe in the “Communion of the Saints.” The author of the Epistle to the Hebrews reminds us that “we are surrounded by so great a cloud of witnesses” (12:1) Our Lord’s own parable of the Rich Man and Lazarus (St.Luke 16:19-31) shows us that those who are in Sheol can ask for help on behalf of their loved ones after their deaths. In the Revelation of St.John, the Beloved Disciple recounts his vision of Heaven. At one point he describes, “the four living creatures and the twenty-four elders fell down before the Lamb, each having a harp, and golden bowls full of incense, which are the prayers of the saints.” (5:8) Later, the Apostle vividly depicts that “the smoke of the incense, with the prayers of the saints, ascended before God from the angel’s hand.” (8:4) Thus, these two passages from the most incredible vision of Heaven inform us that our prayers do rise up before the saints in Heaven as incense which are then brought before the Lord. Finally, St. James tells us that “the effective, fervent prayer of a righteous man avails much.” (5:16b) Why would we limit the assistance we receive in prayer to those who are with us. We can, of course, assume that those who are in Heaven are righteous, so why would we not ask them to pray for us? Back to the original question: why do I (now correcting the language) ask the saints to pray with me? Primarily, I do so because I can. 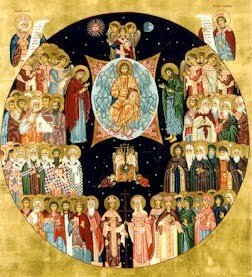 The Communion of Saints is a gift from God and the union of the Church Triumphant (those in Heaven) and the Church Militant (those of Earth) is a mystery of God that allows those of us still here on Earth to benefit from the sanctity of life and the prayers of those who have gone before. I ask the saints who have gone before to pray for me because their prayers were successful on Earth, how much more effective are they when uttered the very throne of God Himself. 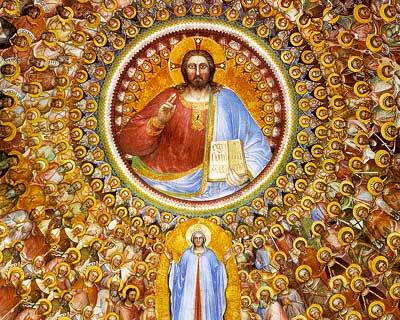 Finally, I ask the saints to intercede on my behalf because I can use all the help I can possibly get! These are not my objections but I would be interested in knowing how you answer them. The Bible gives absolutely no indication that the saints who have died can hear our prayers. The saints are not omniscient. Even glorified in Heaven, they are still finite beings with limitations. How could they possibly hear the prayers of millions of people? God does not answer prayers based on who is praying. God answers prayers based on whether they are asked according to His will (1 John 5:14-15). There is absolutely no basis or need to pray to anyone other than God alone. There is no basis for asking those who are in Heaven to pray for us. Only God can hear our prayers. Only God can answer our prayers. No one in Heaven has any greater access to God’s throne than we do through prayer (Hebrews 4:16). As to your first objection, as I stated previously, the Book of Revelation twice states that our prayers come before the presence of the saints and the Lord as incense rising up before them. Those prayer which we offer up do come before the saints. They may not be looking down over the balcony of heaven with a pair of binoculars and a heavenly hearing aid, but our prayers do come before them. St. John makes that clear. As to the issue of having “time” to answer all those millions of prayers, I read an interesting response. Essentially, the answer was that you are thinking to chronilogically. What is time when you are in the presence of He Who Is And Was And Is To Come? What does time matter to God who is beyond time and the saints who are with Him? St. Patrick, as an example, has all eternity to intercede on behalf of the Irish and the Almighty can simply choose to move effortlessly through time and respond to those prayers whenever he chooses. What would make you or anyone think that “time” is ever an issue in Heaven? On to the second objection, this gets into the very cloudy waters of things like “perfect will” versus “permissive will,” waters in which I prefer not to wade. Nevertheless, we have at least two occasions in Holy Scripture where someone interceded and God “changed His mind.” The first is Genesis 18 where Abraham intercedes on behalf of the city of Sodom and convinces the Lord not to destroy the city for the sake of ten people. God was ready to rain down fire and end it all, and relented upon the intercession of Abraham. The second example is St. John 2, the Wedding at Cana. Our Lord clearly says, “My hour has not yet come,” meaning that it is not yet time for Jesus to start showing His glory. Nevertheless, at the intercession of His blessed mother, Our Lord relents from His non-interventionist position and performs His first miracle. As to your (really) third objection, I believe that I already addressed that. If no one has any great access to the throne than you or I then why would you ever ask any one for prayer? We ask others for prayer because we believe that there is strength in numbers and we want there support. There is reason to believe that the saints can here our prayers, as I previously addressed. You are right in that only God can answer our prayers. That does not mean that the saints cannot intercede with us and carry their concerns to the throne so that God will answer them. Thanks. As I stated, these are not my objections. I see no particular harm or benefit in asking dead saints to pray with me. Revelation 8 does not indicate that the prayers mixed with the angel’s incense come before the saints, although the incident does appear to be observed by John, at least. The prayers, however, go up before God alone. I’m not sure what “time” has to do with any of this. The question was concerning the ability of the saints to hear all of our many prayers. But, since you brought it up, I’m not sure where the idea that “time” is not a factor in Heaven comes from. Revelation 8 begins by stating that ” there was silence in heaven for about half an hour,” and all of the heavenly events depicted throughout the Book of Revelation are sequential. Ok, so they are not “your” objections per se, but referring to them as “your” objections is so much easier than referring to them as “the objections which others raise and you mention out of curiosity.” I do not believe that you can call the entirety of Revelation (even the visions leaving aside the letters to the churches) sequential. The twelfth chapter invalidates the idea of a sequential order. The war in Heaven occurred pre-Creation so that Satan was already cast out when the Garden of Eden was formed. The vision of the woman clothed in the sun is also clearly the Blessed Virgin Mary giving birth to Jesus Christ, “a male child who was to rule the nations with a rod of iron,” yet verse 5b describes Our Lord’s ascension into Heaven, while verses 14-17 describe the flight to Egypt and the slaughter of the innocents. Apocalyptic visions are rarely chronological and I cannot see how this would be considered sequential. As to the issue of time, perhaps I was a bit unclear. Time is irrelevant to God. He could, for example, hear my prayers for blessing over one of my students today and, with no inconsistency on His part, apply that blessing to them in a time of crisis long after I have gone to my eternal reward. More interestingly, I could be praying for my (living) parents and praying that God have mercy on them, bless then and protect them, and the Almighty, thoroughly outside of time, could answer my prayers by sparing them from a car crash years before I was born. Why could He not do so? Thus, in Heaven, the saints have all the time in the world to receive the prayers of the faithful, turn and intercede to God on our behalf. It would not matter if it took a million years for them to get around to hearing my petition and raising it up before the Lord. The Lord could respond by answering the prayer before I hardly had time to say “Amen.” Time is man’s limitation; not God’s. As to the meaning of Revelation 5 and 8, we simply interpret the passage differently. I say, “clearly, it means this;” you say, “clearly, it does not.” There is not a lot more than can be said at this point.